When we talk about Frankfurt in this article, we actually describe the whole area around Frankfurt, which is known as “Frankfurt Rhine-Main” or FRM. It is one of eleven European metropolitan areas. Of those, it is the third biggest in Germany with a population of more than 5,8 mn and a Gross Regional Product of 150+ bn € (approx. the GDP of New Zealand). Obviously, the strength of this community lies in its decentralization. The whole area has something to offer from the European Space Operations Centre of ESA in Darmstadt to the Financial Hub Frankfurt and the knowledge of the universities in Mainz. In StartupBlink’s 2017 report, Frankfurt ranked 4th in Germany and 84th globally. You may not notice from the top of your mind, but there are many successful companies from Frankfurt that play or played some role in your life. One of the highlights is the acquisition of Fintech 360T (a trading network for foreign currencies) by Deutsche Börse (who also runs the Frankfurt Stock exchange and DAX) for 725 mn Euros (almost 800 mn US$ at the time). If you ever paid abroad or used foreign currency, the related transaction might have taken place there. You may also know the shopping club of Amazon, called BuyVIP? The private shopping club was started 2006 in Madrid and Frankfurt. Later it was bought by Amazon. Another e-commerce company is still making headlines in FrankfurtRheinMain. Mobile shop builder Shopgate just recently announced a $15m Series C financing round and started their expansion in the U.S.. Ever played the computer games like the “Anno”-Games? You can guess it, they also come from the RheinMain Area, from a company now know as Blue Byte Mainz. Also, an important player in the gaming industry hails from Frankfurt: You may have never heard of them, but Crytek is a real hidden champion. It’s CryEngine is in the background of many ego-shooting games, as 3d engine (e.g. Far Cry or Crysis). You can also watch others playing games live via Frankfurt-based Rocket Beans TV. Much more recent startups in the RhineMain Area have been successful in crowd-funding, like cobi bike, the 2nd most successful bike related campaign of all times. Also, the Antelope Suite (fitness) has been a very successful crowdfunding campaign, which also received numerous awards. Adding to all of that, there was an explosive growth of all kinds of startups, but especially fintech. A few years back, it was really hard to see any startups at all, now there are more than 200, counting only those that the authors of this article are aware of. Frankfurt has a history of innovation, like being home to the world’s first airline, so it is not surprising that it is a fast growing startup hub. A big advantage of the FRM area is the great number of large corporates (like Deutsche Bank, Schott, Opel, Frankfurt Airport, Merck KGaA, Sanofi, Deutsche Flugsicherung, …). They are not only a source of corporate capital, a cooperation partner but also a very important training ground for entrepreneurs. 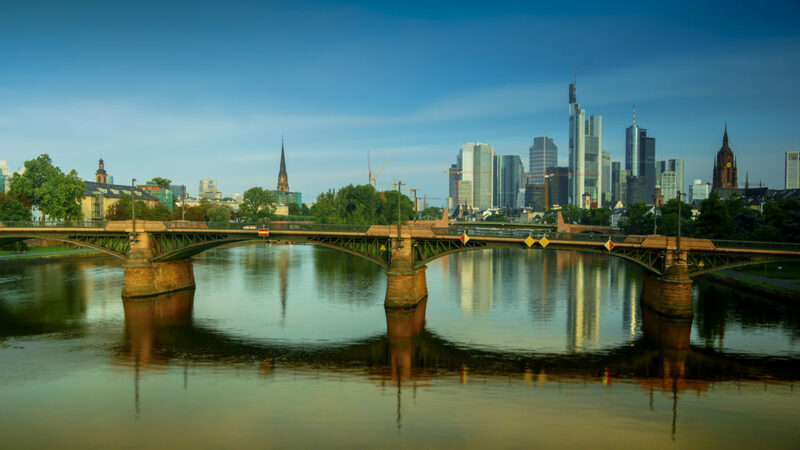 Of course, Frankfurt is a big financial center with 70.000+ employees and very important financial institutions like the ECB, ECB Banking Supervision – SSM, the European Insurance Oversight, German Stock Exchange, Bundesbank, and the German financial oversight Bafin. You may not have noticed, but Frankfurt combines this know-how with its function as a creative center with 60.000+ employees in diverse creative areas as Gaming (e.g. Deck 13 who already won multiple awards) and there are more than 200 companies related to the film industry, who call FRM home. One should not forget the many add, press and creative agencies, employing thousands of creative and bright minds. And research intense institutions like the Unversity of Mainz (where instruments for Mars Exploration Rovers Spirit and Opportunity were built and Nobel laureates teach and taught). Furthermore, its central location within Germany and Europe makes it a logistics hub. Whether it’s data, that is streaming through DE-CIX, the biggest Internet Exchange Point, or physical goods and people (Frankfurt has the airport with the most passenger traffic in Germany). Many capital cities of European countries are reachable in a 1-1,5 hour flight or a few hours more by high-speed train. Some of the busiest Autobahns in Germany / Europe are circumventing or merging around Frankfurt as well. Keep in mind the Brexit and the expected departure of fintech and banks from London. As a financial capital of the EUs largest economy, Frankfurt stands to profit from both. Maybe even adding another EU institution. Finding CTOs and lead developers: More developers with interest in startups are needed. It’s especially not easy to find CTOs and lead developers. Most potential candidates are freelancers, making a really good living in Financial Services. Startups compete with the corporates for exactly this talent and even the ‘daily rates with startup discount’ can run in the hundreds. Finding affordable office space: Rents are expensive, more flexible office space for tiny budgets would help. Company accelerators as well as incubators often come with nice office space and are a big chance for local startups. However, some of the Frankfurt-based corporates decided to open up their innovation labs and accelerators in Berlin, missing the chances of nurturing the local startup community. Finding growth capital: It is always tough to find VCs and Business Angels in Germany, but since many international investors jump Frankfurt in favor of Berlin (even if they change planes here), it is a bit tougher in Frankfurt. Nonetheless, Frankfurt appeared on the radar of many investors recently with fintech and as we try to prove, there is much more. More Networking and self-confidence: A strong ecosystem is made out of money, capabilities and relationships. By bringing together the strengths of the existing players, may it be universities, the corporates, VCs and local governments, joint efforts could make a large difference. There are, of course, many and a growing number of active players in the ecosystem. We just mention a few here, where the order is not a measure of importance. Goethe University is one of the largest universities and has an incubator called the Goethe-Unibator. Also, Technical University Darmstadt has a program for founders, called Highest. Both incubators have brought forth interesting startups. Many local companies and banks opened their incubators and accelerators in Frankfurt. The 2nd largest Bank in Germany, Commerzbank opened the fintech focused Main Incubator (also the host of “between the towers” fintech event series) in Frankfurt. There is also the fintech incubator Gründer Maschine, supported by a local consultancy and also offering startup office space. Fairly new to the game, but with great promise are Accelerator Frankfurt and the fintech hub of Deutsche Boerse, as well as their corporate venture capital arm called DB1 ventures. With all that fintech, one should not forget to mention the health care oriented Merck Accelerator. Also, social entrepreneurship has a place in the social impact lab. Germany’s largest Business Angel Club “FrankfurtRheinMain” also calls Frankfurt home, as well as many national and international VCs. There’s a lot of events happening each week in Frankfurt. StartupDigest is a good way to discover them. 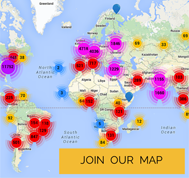 There are globally present event formats like StartupGrind, LeanCamp, Startup Weekend, Product Hunt, FuckUp Nights or Open Coffee Club taking place in FRM. But there are also locally designed event formats like “Between the Towers” and “FinTech Meetup Frankfurt”, where you can meet the local FinTech community. The “Aurelia VC-Meeting” is an evergreen, maybe the oldest event series in our community, but still quite active. If you’re looking for funding, you should check “Pitch Club” as well. You can learn more about other local founders at events like StartupCouch.tv and “Gründer berichten”. Make sure to also check “Gründerstammtisch Frankfurt / Founders Table”, a monthly meetup of the local startup community. EBSpreneurship, organized by students of the European Business School, is Europe’s biggest student-organized entrepreneurship conference, with keynotes from top Entrepreneurs and VCs. If you’re interested in tech topics generally you can check “Webmontag Frankfurt” as well as several user groups for all different kinds of programming languages, approaches and methods. There are several locations where you can CoWork in the FrankfurtRheinMain are. This list is focused on some of the better-known places where you can just drop by, start working and connect with the local community. Die Zentrale, Frankfurt: located in the northeast of Frankfurt. It provides a specific working area for “Nomads”, but you’ll see that the “Residents” in this friendly place are very open-minded and talkative as well. Thanks to the nice hosts this location is a regular location for user groups and other events. Meet’nWork, Frankfurt: straight next to the train station. More business oriented, this place provides you with everything you need for a productive work day, including several meeting rooms you can let. heimathafen Wiesbaden: you could not speak of a startup community in Wiesbaden, without taking about the heimathafen that cultivates the local scene with its coworking opportunity, as well as many events each week. M1-Coworking, Mainz: centrally located next to the train station. Newly build, this is architecturally interesting as it is for your coworking. From this place, you’ll find it easy to connect to the tightly knit Mainzer startup community. CoWo21, Darmstadt: not far from the train station you might get one of the six flex desks for coworkers. Coworking Königstein: If you’re in the “Taunus” the next coworking place might be this nice place with its friendly host Jean-Paul. There are other places like founder hubs that are as good to connect with the local community but don’t officially provide short term coworking options. The Frankfurt startup ecosystem provides many opportunities to entrepreneurs owing to its growth in fintech, abundance of educational centres and location. However, it needs to develop a more robust culture of funding, networking and startup talent to grow further. Paul Herwarth von Bittenfeld is an agile and lean IT entrepreneur, a partner at software company //SEIBERT/MEDIA and founder of Rhein-Main-Startups.com.